California Blacksmith is the CBA’s bi-monthly magazine featuring upcoming CBA events and news, interviews with artists, technical articles and more. 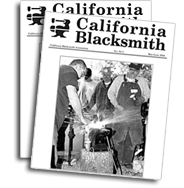 A subscription to California Blacksmith is included in your membership, as well as access to the complete CBA archives featured here. In order to access archives you have to be a CBA member and will be required to log in with your account password.